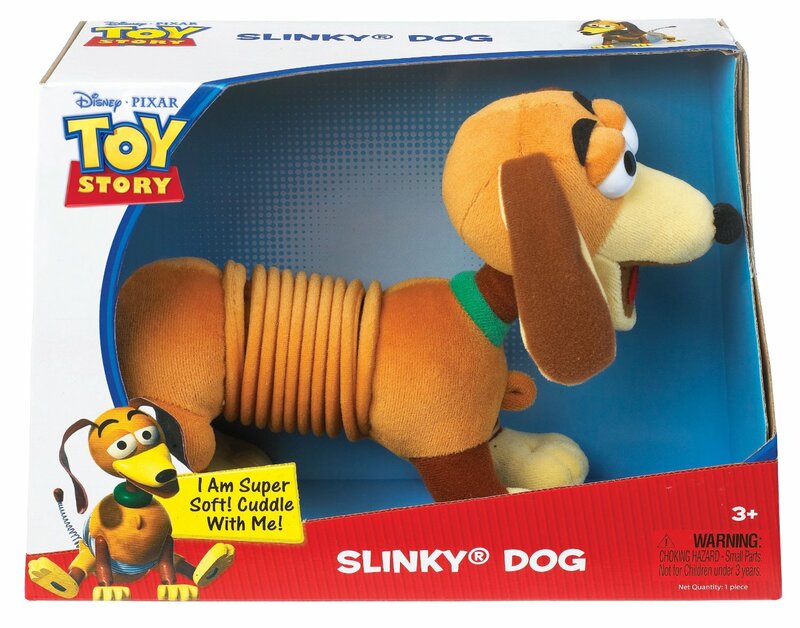 Slinky Dog has been a favorite childhood toy since the 1950s. Today, children recognize him from the widely popular "Toy Story" movies. Now your kids can have a softer, cuddlier version of their favorite companion. This plush Slinky dog features a stuffed head, upper body and legs. The middle of the body is made from a plush-covered slinky. The slinky portion of the body expands when pulled, but the ultra-soft material gives it a comforting texture children will love. Perfect for car rides, nighttime snuggles and everyday cuddling, this toy measures 10 inches long. It is recommended for children ages 3 and up. Come visit our Cozy Cottage! This cozy cottage has a lot to offer: a comfy living room, a busy dining room, a spacious balcony, and a peaceful bedroom--even a spiral staircase. Lounge around on the couch, eat a nice dinner, and then hit the hay! There's plenty to play with right out of the box, including a family of three 4.25" wooden dolls and 10 pieces of wooden furniture. 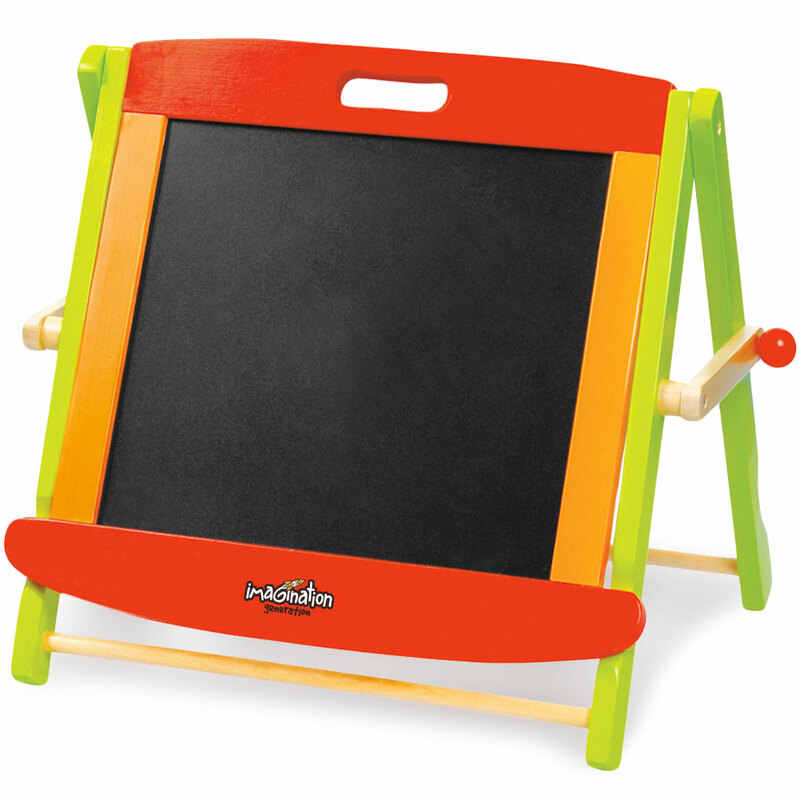 As always, our toys are built with real cuts of all-natural wood and brightly colored with safe paints. Assembled measurements: 17" x 16.5" x 9.75". Adult assembly required. Philips screwdriver not included. From sunup to sundown, this is one busy city! It's a new morning in the bustling city. The sun is just rising, the school bus is picking up students, and the cars are taking their drivers to work. But no matter how busy, everyone is careful to obey the street signs! Why You'll Love It: Bead mazes are a great source of multi-sensory discovery, and the fun urban theme provides hours of open-ended, imaginative role-play. There are all kinds of exciting shapes, and the twisty, turny, colorful bead runs are set right in the middle of a lively city. Your child will love guiding the beads along their tracks, navigating the tall hills and loop-de-loops, all the while developing fine motor skills and visual tracking. And down below the maze there's even more fun! Three vehicles are making their way through the streets. They stop for the stoplight, make turns off the main road, even pull into a parking spot so other vehicles can pass! 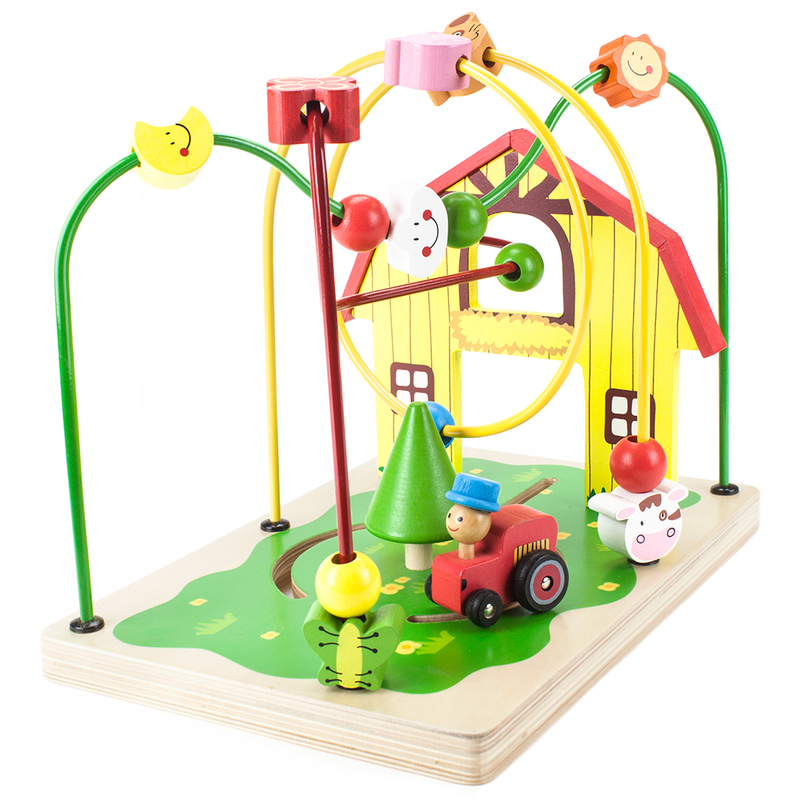 This toy encourages exploration and play outdoors as well as balance and mobility in early childhood. As with all of our Imagination Generation Playsets, this set is made from natural cuts of wood and finished with water-based, safe paints. Taking your first steps is no walk in the park. ThatG++s why this classic learning toy goes the extra mile in providing vital support and stability to toddlers just learning to walk. Your child will laugh in delight with each pop-pop-popping of the red, blue, and green balls. Soon they will be exploring every nook and cranny of the house with their Push-n-Pop walking toy. 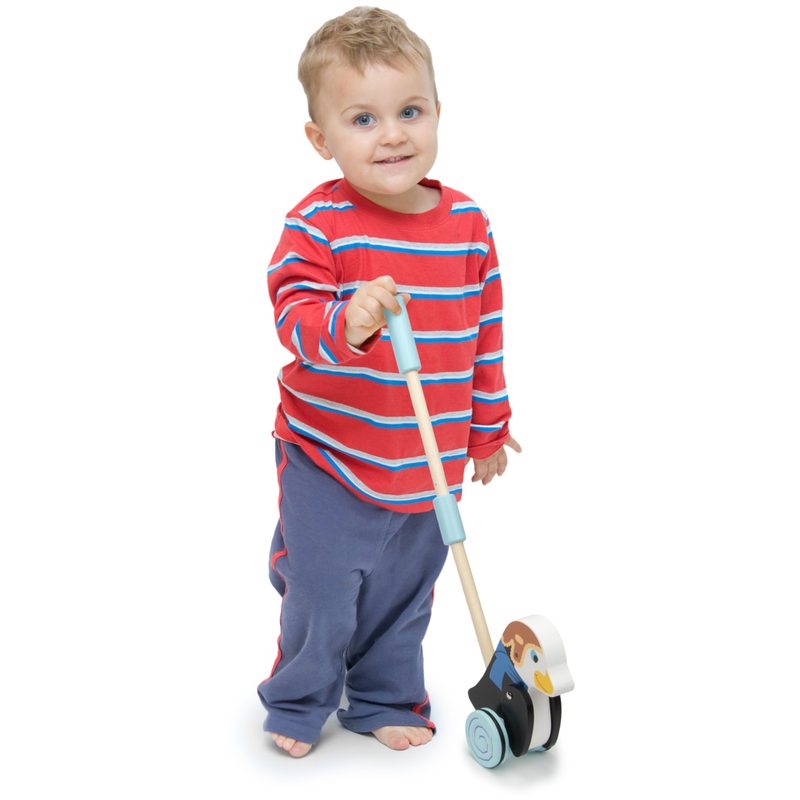 Our walkers are 14" tall and have easy to grip handles so your child can stand and push with ease. 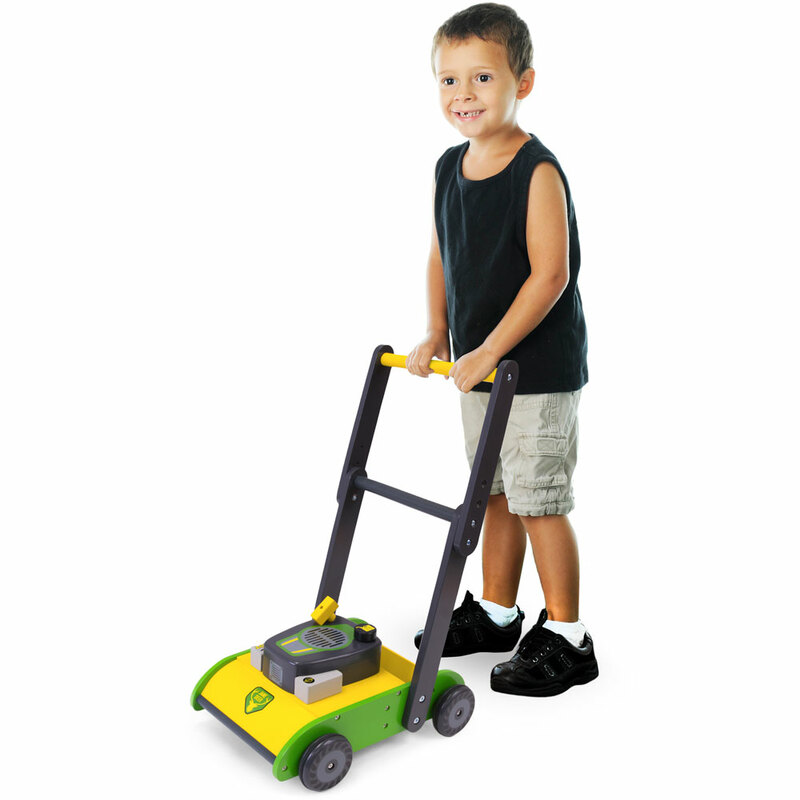 You can practice on any surface as it has scratch free wheels. 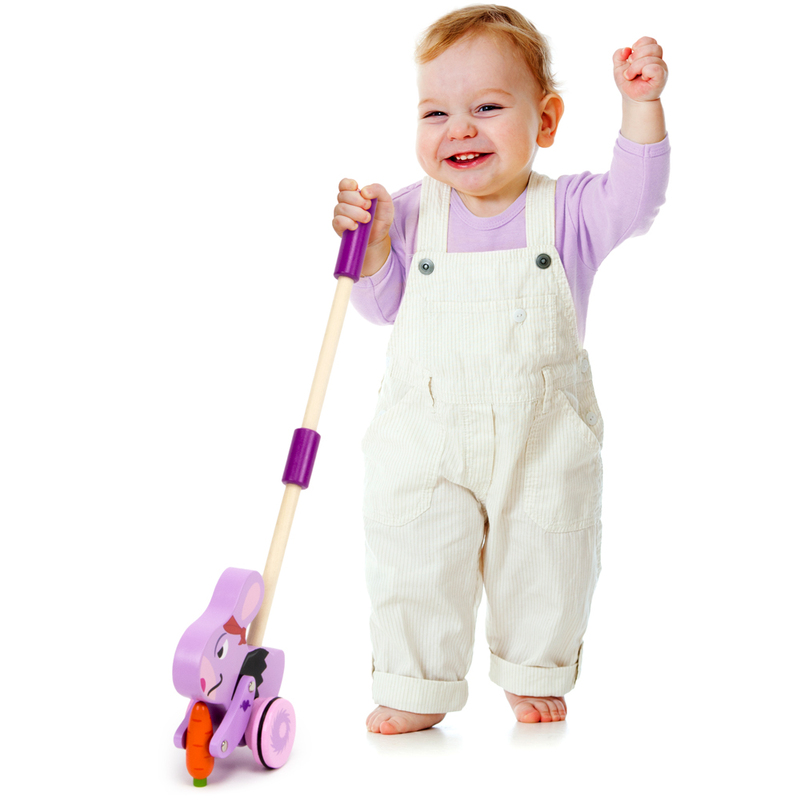 Each push of the walker will create a fun, popping reaction, teaching your child about cause and effect! Push toys have become timeless classics for many generations. 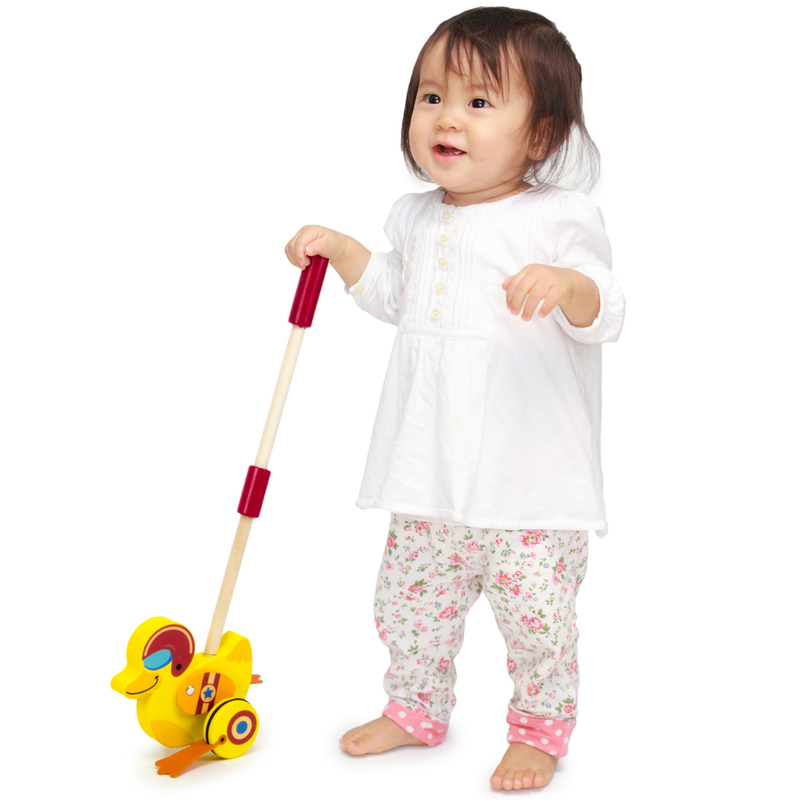 Our Push-n-Pop toy continues the tradition of walking toys while adding colorful, corn popper fun to keep your child moving! They help develop fine and gross motor skills, and they really grow with your kids, keeping up with crawlers and walkers alike! This walking tool is cut from solid wood and is finished with safe, water-based paints. 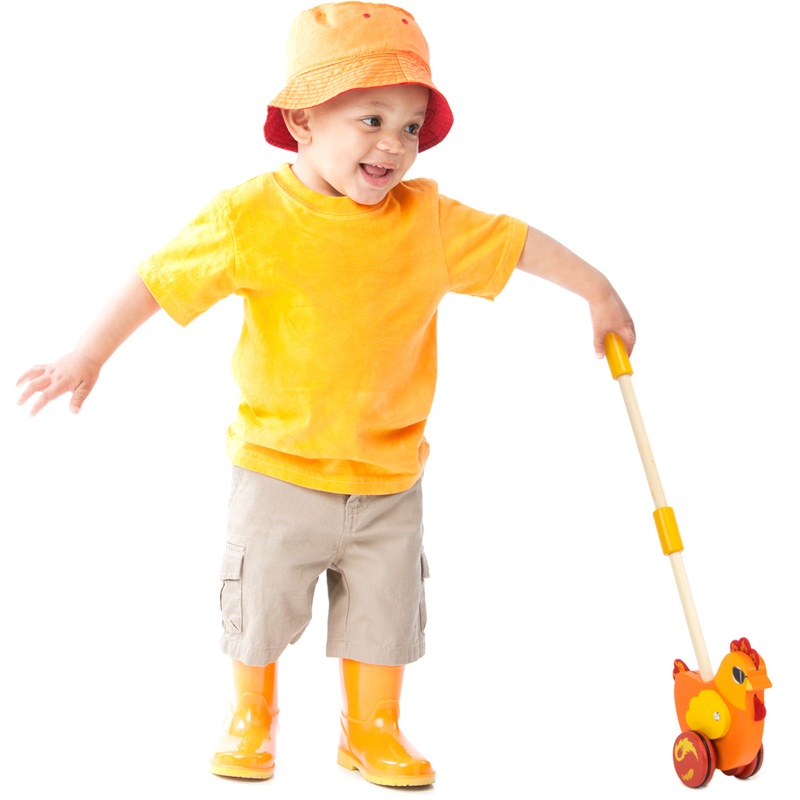 It encourages exploration and discovery with every step along the way to learning to walk. Kick the Fun into Overdrive! Madcap Penguin is known as the thrill-seeker of his colony. YouG++ll often find him with his cap strapped down tight, ready to dive head first down the tallest of glaciers. Are you ready to take the plunge with this bulleting bird? ItG++s no easy feat teaching a child to gain balance and start moving; letG++s take it up a notch! 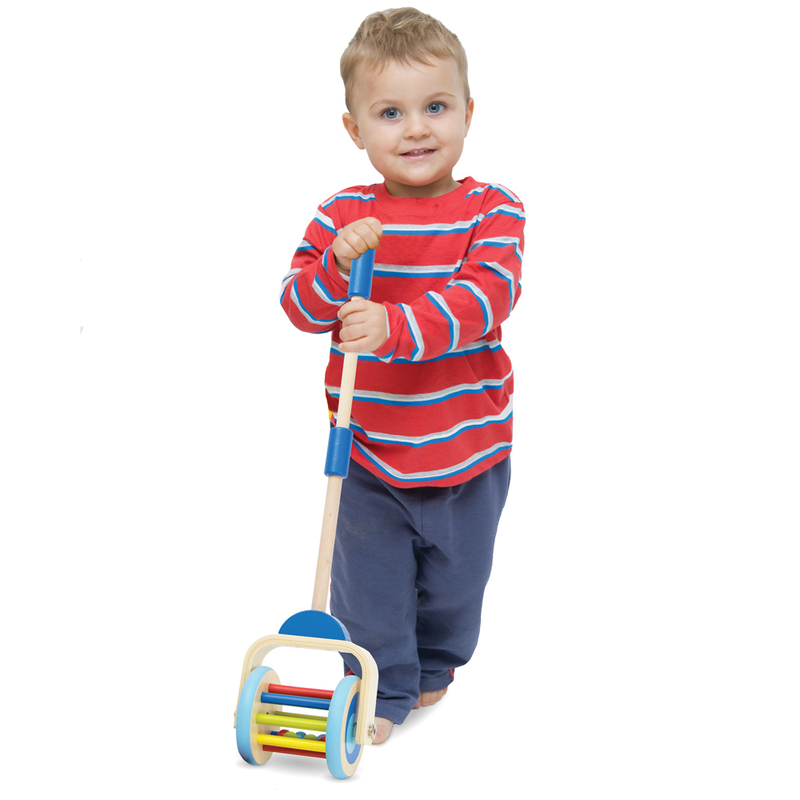 Your child will have a blast learning to walk and run with this radical twist on the classic push-along learning toy. Connected by a fun traffic theme, this hub is comprised of five multimodal activities. 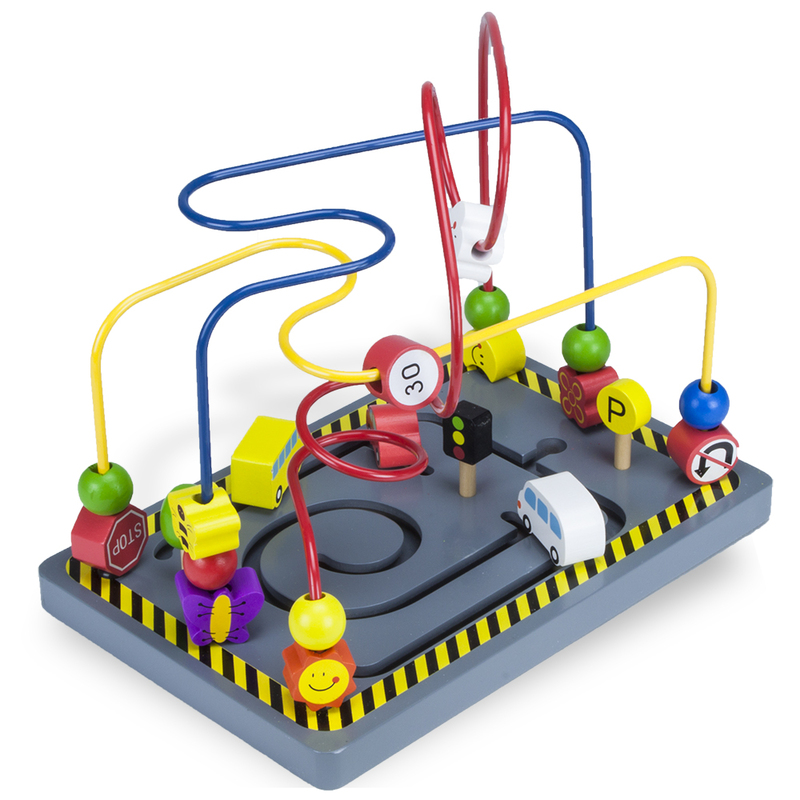 Your child can explore motion with turning gears, use logic to maneuver vehicles on a busy road, develop memory and vocabulary with flash cards, race around the bead maze, and develop fine motor skills and express creativity on the whiteboard. The cube stands up to 14" tall and 8" wide, but the bead maze flips and tucks flat for quick, easy, stackable storage. What is Multimodal Play? Multimodal simply means "many modes." Toys that are multimodal engage children in a variety of modes of play at once. They engage many learning processes and encourage seamless transition between them, a vital process for growing minds! Spicy Chicken is the undefeated champion of the chicken coop circuit on Farmer RalphG++s farm. HeG++s known for his flashy showboating and use of pyrotechnics. Can you stand the heat with this roaring rooster? Top Duck is the wildest, most daring pilot to ever come out of his prestigious flight school. YouG++ll often find him racing alongside Gander, his loyal flight partner. Are you ready to push the boundaries with this mettlesome mallard? Standing over 3.5 feet tall, the Living Large! 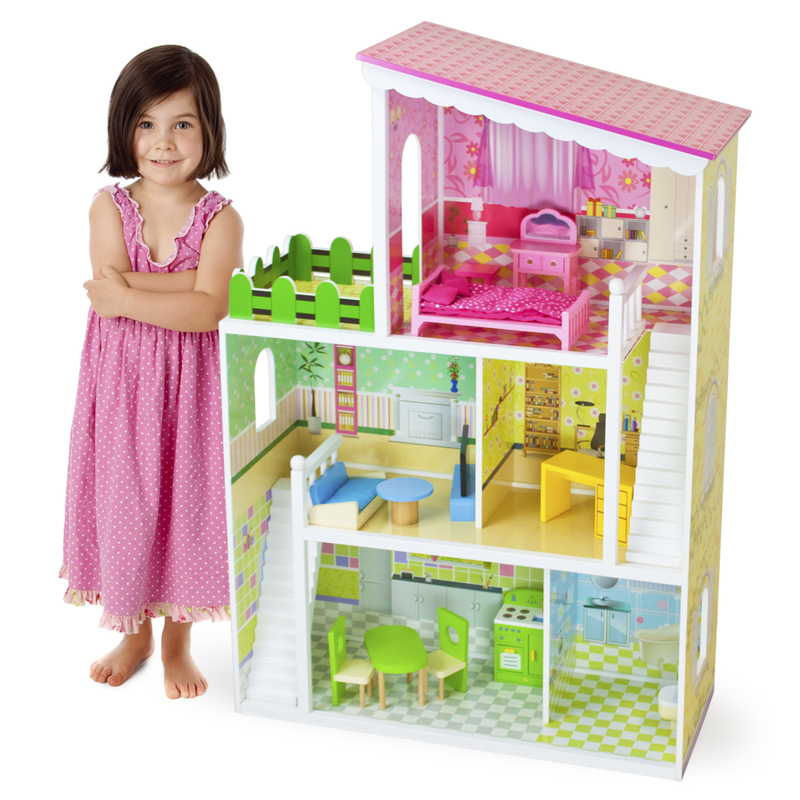 Modern Doll House is big enough to accommodate several playmates, so bring a sibling, or invite a friend! Featuring an updated, modern look, it includes 18 pieces of wood furniture, including a flat screen TV and real cushions, pillows and bedcovers. And, constructed with hardy wood components, this doll house is built to last. Why You'll Love It: On top of the chic, modern furniture, there are tons of extra details printed onto the doll house walls to help complete the scene and jumpstart the imagination! Across three floors are 5 distinct rooms and a spacious balcony. Try moving some furniture out onto the balcony for extra outdoor fun! What's in the Box? The unassembled doll house, assembly instructions, and 18 pieces of furniture. Assembled measurements: 43" x 29" x 12". Adult assembly required. Philips screwdriver not included. Take a Step Toward Learning! We know that early learning comes in baby steps. That's why our Push-n-Play Learning Walker provides enrichment to toddlers during every stage of learning to walk! 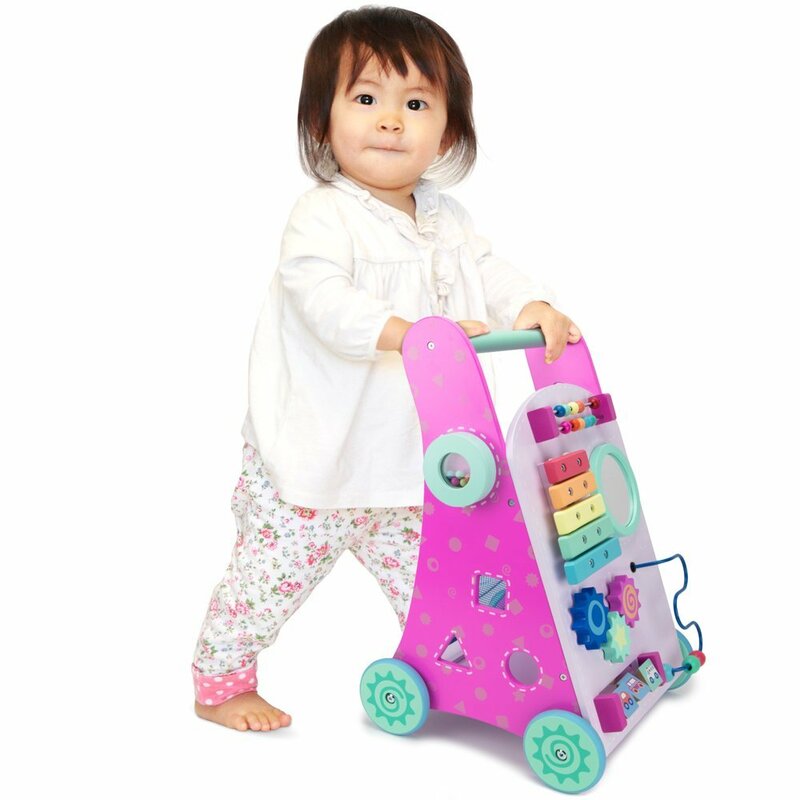 There are plenty of fun activities for youngsters who can sit up on their own, new walkers are provided vital support and stability for shaky steps, and full-fledged toddlers can pack up their toys in the included pocket, then zoom around practically anywhere! 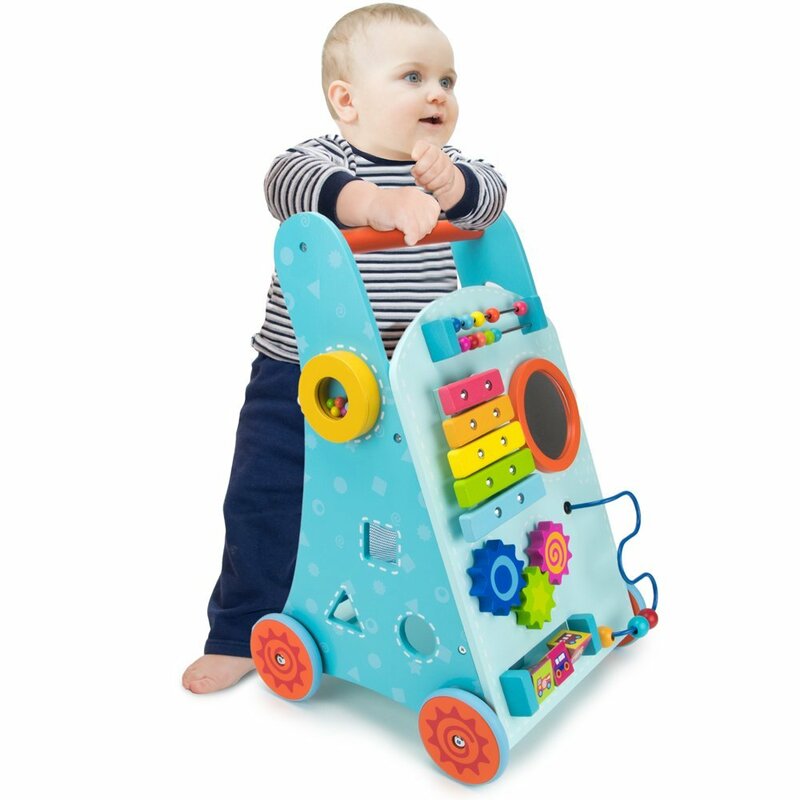 Cut from solid wood and finished with safe, water-based paint, our Push-n-Play Learning Walker develops dexterity and both fine and gross motor skills. It encourages exploration and discovery with every step. No other learning walkers pack this much learning into one toy! Count on the abacus, jam on the xylophone, or drive the cars through the maze. Crank the spinning gears, go for a stroll, or spin and match the vehicles. Guide the beads along the rail, learn and sort the shapes, pound the ball drum, or make silly faces in the mirror. Your child can bring their favorite stuffed animals, toys, and blankets along for the ride with a handy storage space pocket. What a busy, bustling farm! Farmers Ben and Brenda and their dog Rufus work hard every day to keep all their animals corralled. They have pigs, horses, rabbits, cows, ducks, and chickens! Can you help them take care of all the different kinds of animals they keep in their bright red barn? 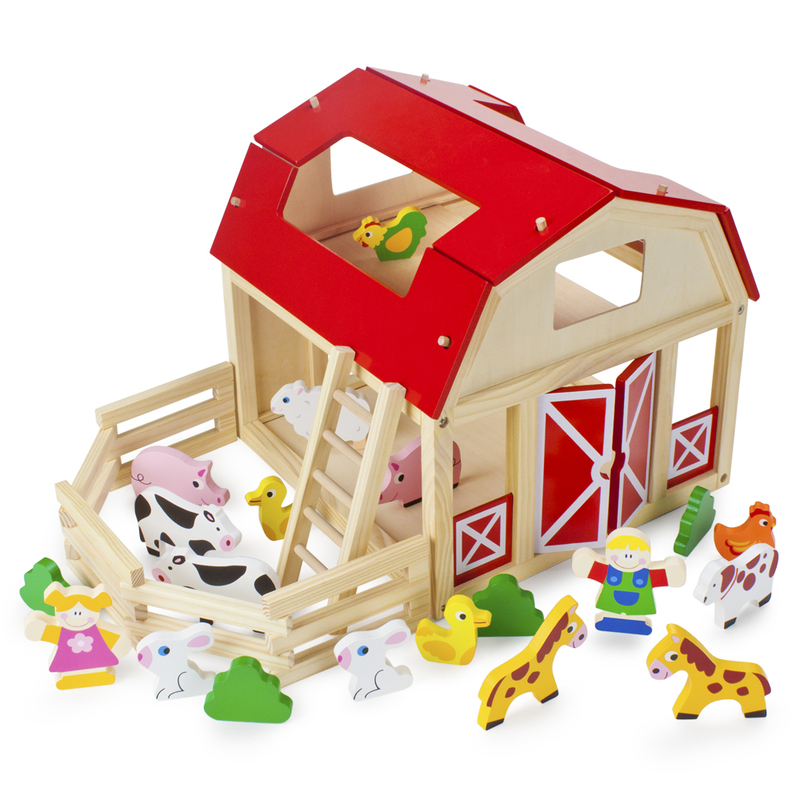 Why You'll Love It: Our Busy Barnyard playset comes with 22 accessories, including 14 farm animals, so kids can play right out of the box. The barn has a loft on the second floor for extra play and storage space and comes with an adjustable corral so the animals can safely graze in the pasture. There's hours of pretend play packed into this single playset, and there's more than enough pieces to share with a friend! As always, all pieces are cut from natural wood, sanded smooth, and vibrantly colored with safe paints. The barn measures 11.5" long, 11.25" tall, and 11" wide. It's perfect for early learners 24 months and older. Adult assembly required. How much can the pig eat before he pops? Find out with Pop the Pig, a hilarious game where players feed the pig and watch him get bigger and bigger until...POP! To play, roll the die and feed pig the matching colored hamburger. Press the pig's head down each time you feed him. If his belt explodes, you lose! 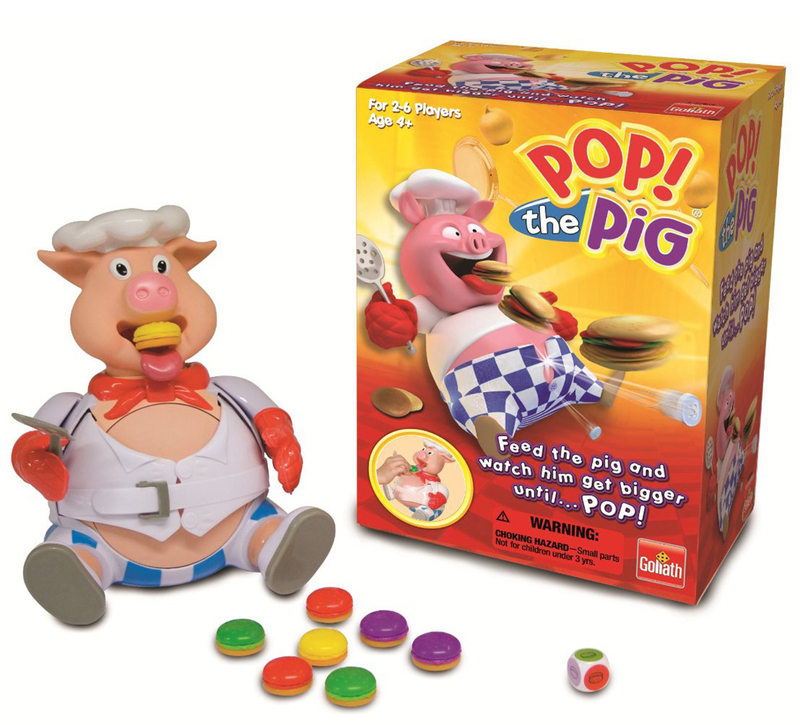 Pop the Pig is recommended for two to six players ages 4 and up. Each game comes with a piggy chef, four purple hamburgers, 4 red hamburgers, four yellow hamburgers and four green hamburgers. Kids will enjoy seeing how much the big can eat until he bursts through his belt. This suspenseful game is a perfect idea for any family game night. It's a such a busy day downtown that there's nowhere to park! But don't worry, just pull into the parking garage and let the attendants guide you to a spot! The Downtown Deluxe Parking Garage has 4 floors and parks over a dozen cars so you can bring along all your favorites. There's even a gas station and a real, working elevator that takes cars up and down. 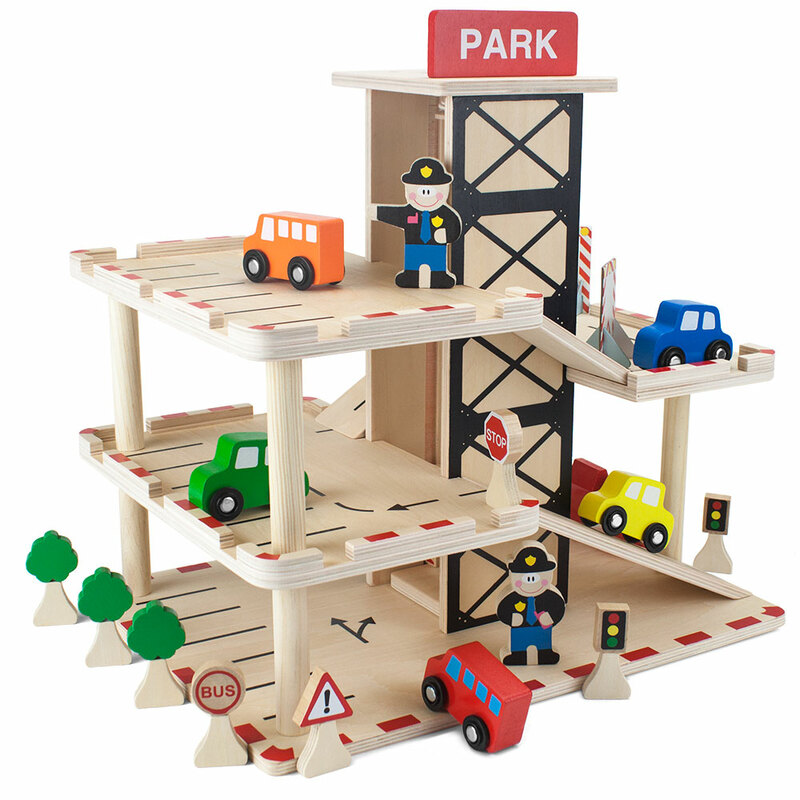 Why You'll Love It: We've included 5 wooden cars and a total of 19 accessories right in the box, so you're play-ready the moment after (or during!) assembly. There's hours of imagination-powered pretend play packed into this playset, no batteries required. As always, every piece is cut from natural wood and colored brightly with safe paints. 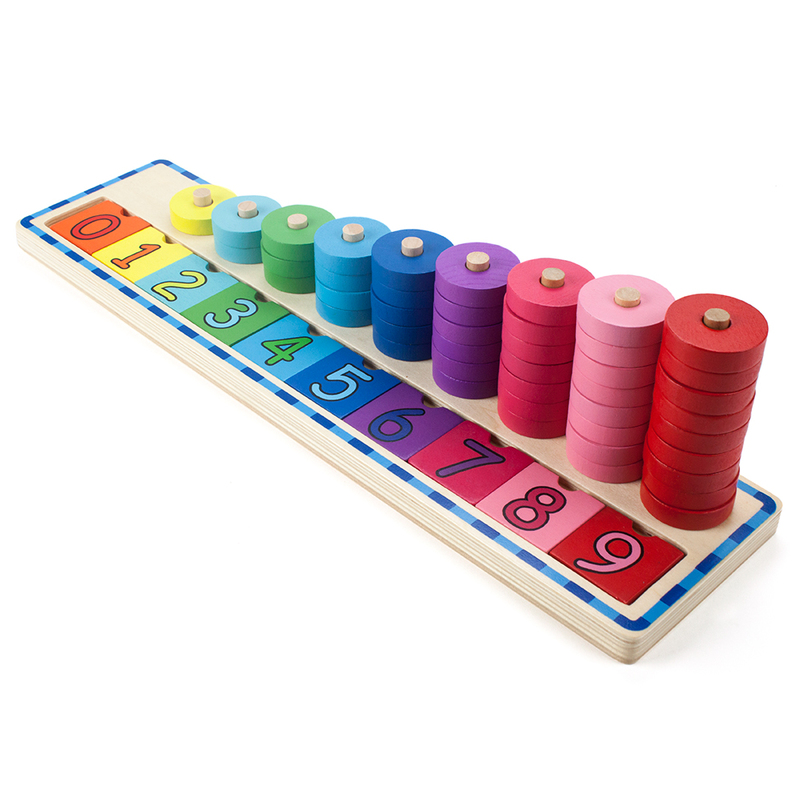 Get a head start on the fundamentals of math and counting with our Colorful Counting Number Stacker! Early learners love to get hands-on and stack and sort the colorful discs, which is easily extended into counting exercises, number recognition, and simple math facts. Count up the rings in groups, match the colors, reorder the removable number tiles--there are so many enriching activities in this simple toy! Why You'll Love It: Our stacker is a simple, traditional and natural counting tool that kickstarts early math learning with a Montessori spirit! Stacking up and sorting the discs hones fine motor skills and encourages critical thinking. And all pieces are cut from natural wood, sanded smooth, and vibrantly colored with safe paints. 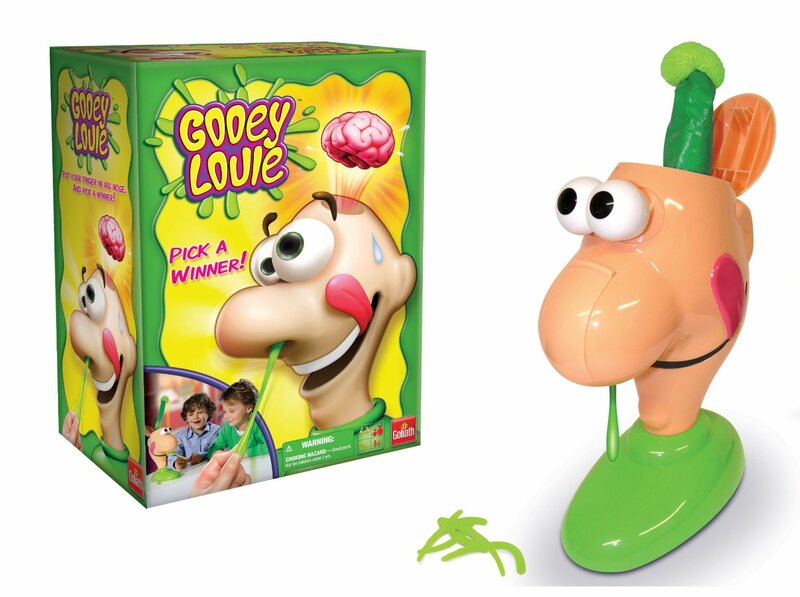 Gooey Louie is a nose-picking good time for the whole family! When it's your turn to play, pick Louie's nose and pull out a gooey. But watch out! If you pull out the wrong booger, he'll flip his lid. His eyes will pop and his brain will fly out! 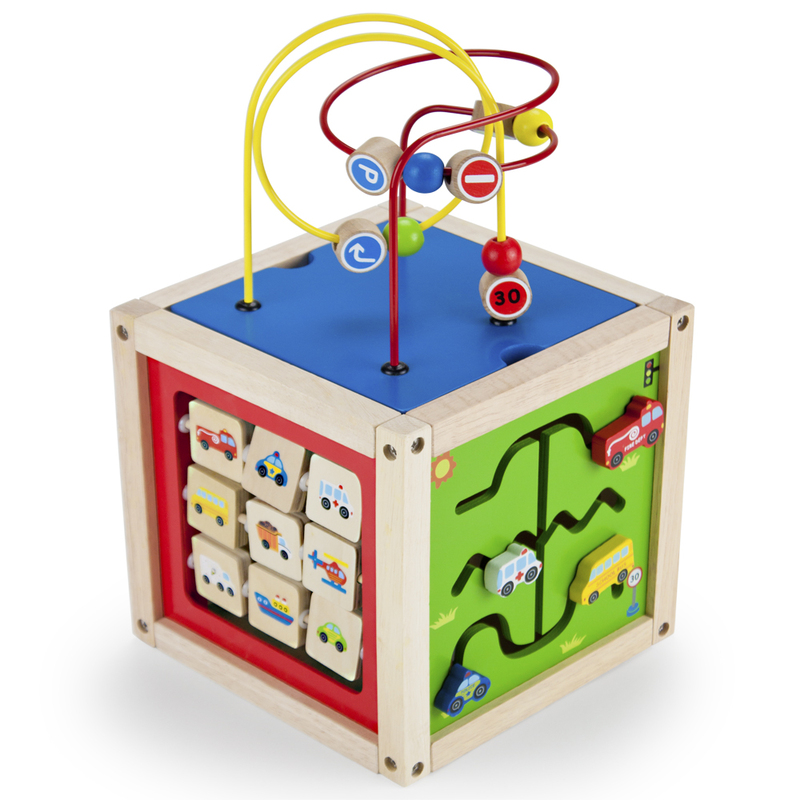 Why You'll Love It: Our Four Seasons Magnetic Playset is the perfect toy for traveling without a screen. The sturdy wooden carrying case clasps shut tight and fits all the 41 included magnets with plenty of room to add more from favorite sets! Mixing and matching magnets to create seasonal scenes is a great source of creative expression and develops storytelling skills. It's classic, enriching fun, all wrapped up in a convenient package. For even more extension activities, take down the backdrops to use the interior as a dry erase board, or flip it over and use the exterior as a chalkboard. What walks down stairs, alone or in pairs and makes a slinkity sound? A spring, a spring, a marvelous thing! Everyone knows it's Slinky. It's Slinky, it's Slinky! Almost everyone has heard this catchy jingle. 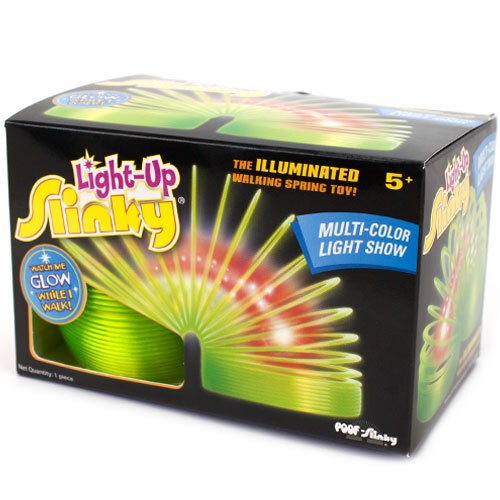 A nostalgic toy still widely popular today, this Plastic Light-Up Slinky makes the perfect idea for goody bags, stocking stuffers, prizes, party favors and more. Featuring an on/off button, each Light-Up Slinky creates a multi-color LED light show while it walks. Three AG13 batteries (included) are required to operate this toy. Whether you play with it in your hands or make it walk, spring or flip down the stairs, this Light-Up Slinky is sure to provide hours of entertainment when the lights go out. 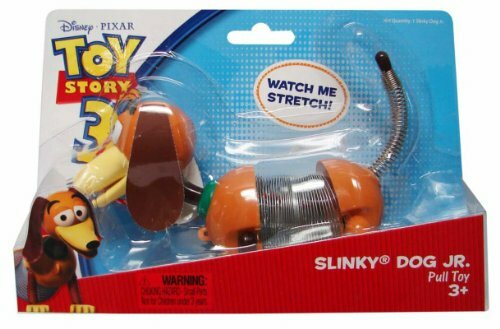 Disney Pixar Toy Story Slinky Dog, Jr. Disney Pixar Toy Story Slinky Dog, Jr. Your kids will recognize him from the widely popular "Toy Story" movies. However, this Slinky Dog Jr. is a miniature version of the classic toy that has been delighting children since the 1950s. Each toy features metal accordion-style springs in the center of his body so this cute pup stretches out when he's pulled. When you tug on his leash, this loyal dog will follow you around. His hind legs jump forward and move with him and his spring-style tail wags and jiggles around. This item is made from metal and plastic components. Before he is extended, Slinky Dog measures approximately 4 inches long and 4 inches tall. This toy is recommended for children over the age of 3. Turn any table into a studio! Art is so vital to your child's development and achievement. In the hand of a child, a simple piece of chalk, a crayon, marker or paintbrush becomes a direct conduit to the imagination. But it also becomes an invaluable instructional tool. Writing readiness begins with scribbles. Occupational therapists agree that inclined surfaces are best for developing fine motor skills by instilling proper wrist position and a functional pencil grip. New worlds mean new language. Talking to children about their creations transfers crucial vocabulary and refines critical thinking skills. A new kind of problem solver. Creating art is a series of ideas, experiments and decisions. Children who express themselves artistically develop a sense of innovation and decisiveness. What's in the Box? 3-in-1 board on easel stand, two knobs and spacer arms with fasteners, and 10 number magnets from 0 through 9. Measures 17" wide and 14" when standing. Light adult assembly required. All fastening hardware included. Slinky Dog has been a favorite childhood toy since the 1950s. Today, children recognize him from the widely popular "Toy Story" movies. Now your kids can have a fun, wind-up version of their favorite companion. 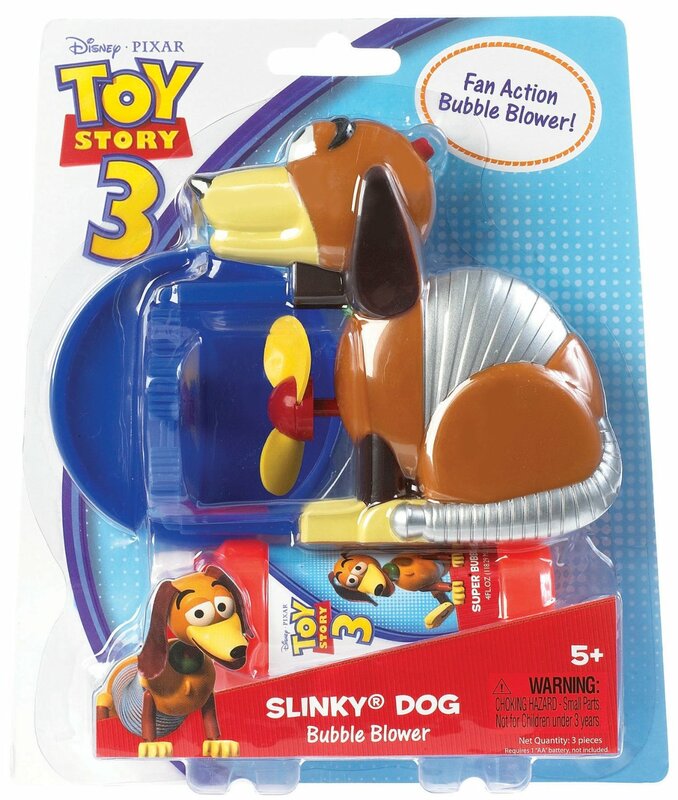 Kids will love playing with this bubble-blowing version of Slinky Dog, a beloved character from the widely-popular "Toy Story" movies. Perfect for backyard fun, pool parties and other outside activities, this bubble-blowing Slinky Dog is sure to provide hours of entertainment. To start, simply pour bubble solution (included) into the designated tray. Then, dip the bubble blower into the tray and press a button on Slinky Dog's head. Children will be delighted as they watch the bubbles soar! This item requires one AA battery to operate, which is not included. Bubble-blowing Slinky Dog is recommended for ages 5 and up. Get the inside scoop on running your very own ice cream shop. Go ahead, stand behind the counter of your ice cream cart and take your orders! Each cone is topped with a big scoop of ice cream, all ready for you to serve up to six hungry customers, and every flavor is delightfully decorated with sprinkles, hot fudge, and strawberry sauce. You'll be a pro scooper in no time! Playing pretend is a great way for little ones to develop crucial social skills. Your child will learn to serve others, take turns, and share, and everybody loves ice cream! 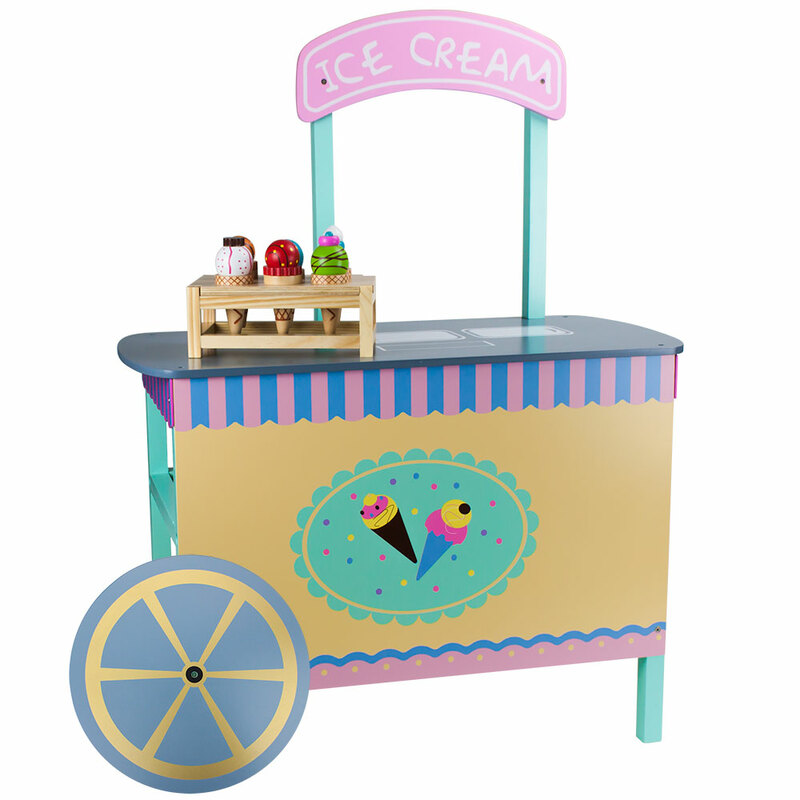 The cart itself stands 3 feet tall, but the counter is just 20 inches from the ground, the perfect size for toddlers. There's plenty of shelf space beneath the counter to store extra food, so this cart makes a great addition to any pretend kitchen - or the beginning of a new one! Almost everyone has heard this catchy jingle. 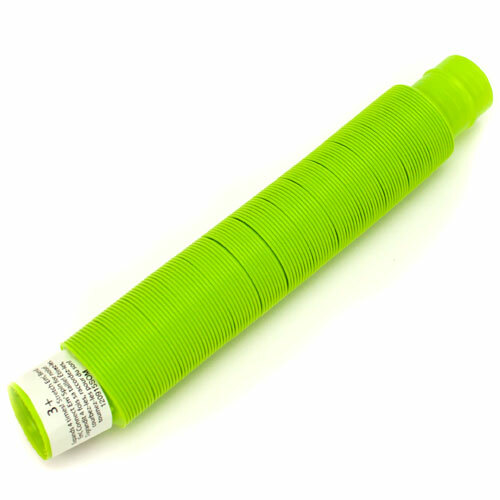 A nostalgic toy still widely popular today, this Original Plastic Slinky is the perfect idea for goody bags, stocking stuffers, prizes, party favors and more. Whether you play with it in your hands or make it walk, spring or flip down the stairs, Slinky is sure to provide hours of classic entertainment. Slinky originally debuted in 1945 and since that time, more than 300 million have been sold worldwide. 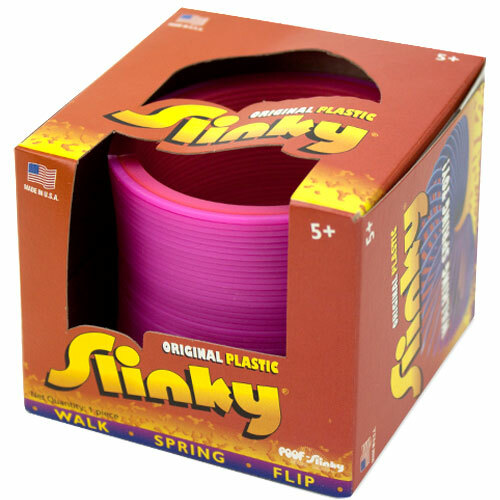 Each Slinky is made in the United States and is recommended for ages 5 and up. Colors may vary. Your kids may recognize him from the widely popular "Toy Story" movies. 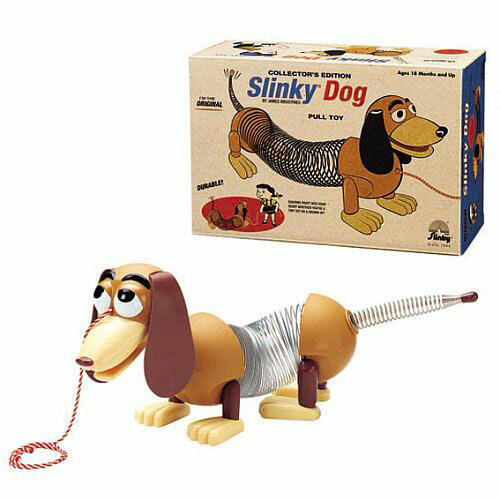 However, this Slinky Dog has been a classic toy since the 1950s. Featuring retro packaging, this quality toy has delighted children for generations. When you pull on his leash, this loyal dog will follow you around. With metal accordion-style springs in the center of his body, this cute pup stretches out when he's pulled. His hind legs jump forward and move with him and his spring-style tail wags and jiggles around. A certificate of authenticity comes with each item, so you know you are purchasing a truly amazing toy. 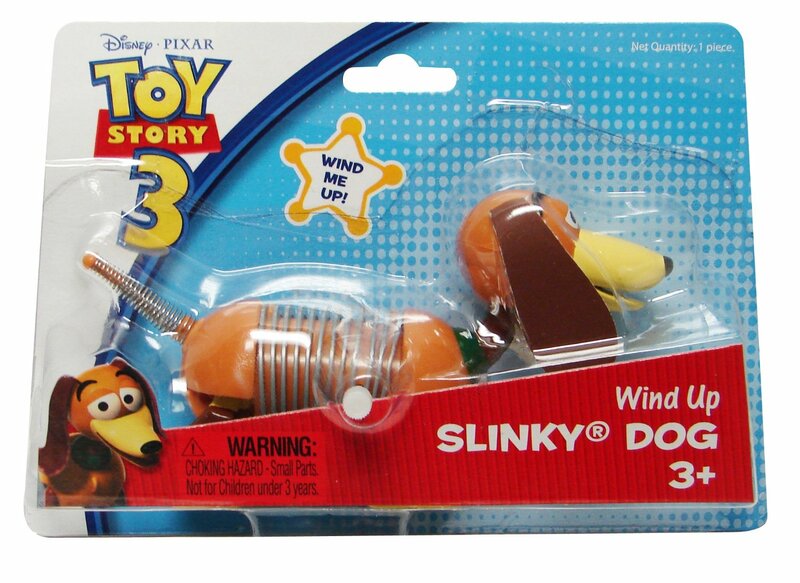 Slinky Dog is recommended for children 18 months and older and is made from both metal and plastic components. Almost everyone has heard this catchy jingle. 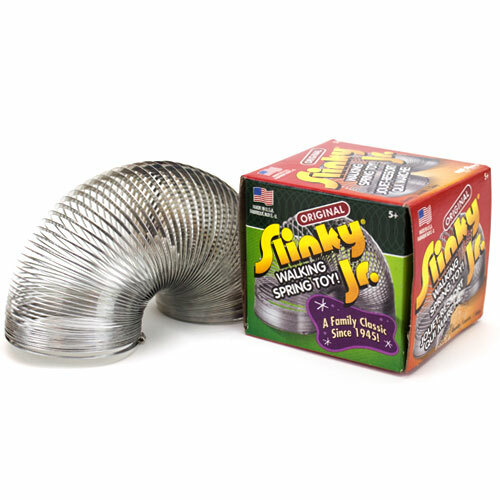 A nostalgic toy still widely popular today, this Original Metal Slinky Jr. makes the perfect idea for goody bags, stocking stuffers, prizes, party favors and more. This item is silver in color and is a miniature size. Whether you play with it in your hands or make it walk, spring or flip down the stairs, Slinky is sure to provide hours of classic entertainment. Slinky originally debuted in 1945 and since that time, more than 300 million have been sold worldwide. 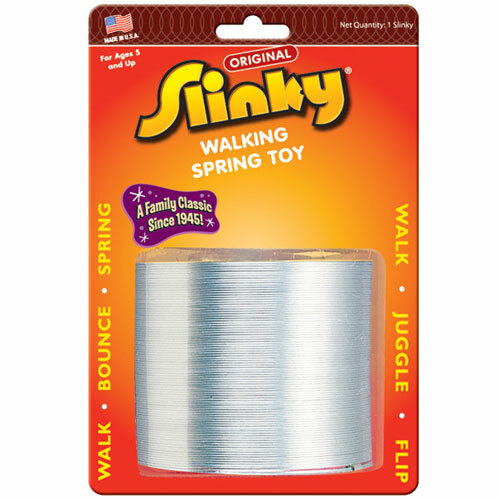 Each Slinky is made in the United States and is recommended for ages 5 and up.